Fleet Foxes frontman Robin Pecknold will support indie songstress Joanna Newsom this Friday at the Lobero. In what is no doubt the S.B. booking coup of the year thus far, Club Mercy brings eccentric indie chanteuse Joanna Newsom to the Lobero Theatre this Friday, July 30. The California-born singer, songwriter, and harpist has long been heralded for her lilting deliveries, complex song structures, and dazzling lyricism, but it was this year’s dizzyingly ambitious Have One on Me that’s pushed Newsom’s rising star to altogether new heights. Despite all this, it’s Newsom’s opening act who’s currently captivated the attention of the music-loving masses. 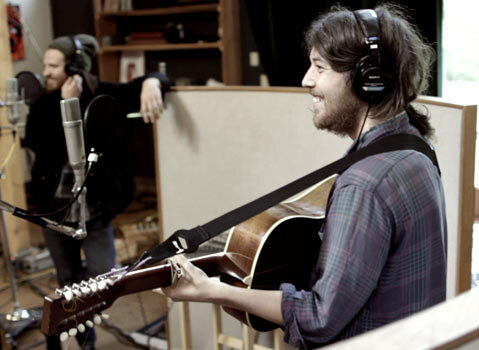 As the frontman for Seattle folk darlings Fleet Foxes, Robin Pecknold has fast become one of the most recognizable voices in modern rock. A powerhouse in every sense of the word, Pecknold’s range, strength, and love of all things harmony have helped to guide the Foxes from relative obscurity to international success story. Plus, they give one of the most captivating live shows I’ve caught in years. Currently, though, the band is hard at work on the follow-up to their 2008 self-titled debut. While Pecknold has recently spoken of the pressures involved in crafting the next Fleet Foxes album, little else is known about the material, and this small string of tour dates with Newsom is doubling as a chance for the singer to test the waters, so to speak, with his new tunes. I recently spoke with Pecknold via email about the tour, the record, and his newfound musical friendship with Newsom. I know you’re in the middle of recording with the band. What prompted you to go out on the road now? The first time I opened for Joanna in the Midwest was super fun, just me and my brother and sister in a minivan, seizing the day, hearing her crazy band play every night. It was great to be asked again, and so of course I said yeah, even though it’s a weird time to do so. It’s just a small break during the recording process, so I’ll get back to that soon as we’re home. How did you and Joanna first meet? Backstage at the first show of the last run I opened up for her in Nashville, I think. Were you familiar with her music beforehand? Yes, super familiar, and a huge fan!! Can you tell me a bit about the White Antelope project? Where did the name come from? I don’t know that that’s a project. I recorded some older songs that I like and put them on [a MySpace] last summer, but have let it languish. The name came from an Automatic Animal Name Generator. Are there plans to record a solo record any time in the near future? Sure. I’d like to just keep recording and being involved in music more, maybe recording a solo album of acoustic guitar music, or coming up with a different band to do things with when Fleet Foxes are between tours and albums. After our first record came out and had success, I kind of hid away for a year, not sure what to do, and I don’t want to do that again! I want to keep going. I feel old; the clock’s ticking. I imagine there’s a big difference between performing with a five-piece and performing solo. What’s been the biggest challenge in moving from one to another? There’s a lot of security in playing in a band. But the accountability of a solo performance is fun, too. If it’s boring or bad, it’s my fault only. I’ve also heard a bit about Rainbow Fang, the band you’ve been working on with your sister. Can we expect to hear that in the coming months? We worked really hard on that for a while, and then the recording of this record and just life circumstances put the brakes on that album, but I really like it and hope we finish it soon. How far along is the new Fleet Foxes record? It’s fairly far along at this point; a bunch of detailing work remains, but the bones of it are almost done. It’s taken a bit longer than we wanted, but it’s all for the best. It’s all in the interests of doing the thing right. Do these solo dates help relieve some of the anxiety involved in putting that together? Nope! I get way more nervous playing alone, and being an opening act brings its own grab bag of anxieties, but it’s really, really fun to be on tour in this way, and I love the West Coast and Joanna’s music, so it doesn’t really matter. Finally, what can we expect from the Joanna Newsom dates? Are you performing mostly covers, or originals? I think I’m mostly going to play new songs from the new record and maybe a cover. I don’t have too much time onstage. What did you think when you first saw Joanna play? She’s just incredible. It’s a combination of heart and ambition that you rarely see together in such great quantities—usually it’s one or the other. She takes a while to tune her harp, though. Joanna Newsom and Robin Pecknold play the Lobero Theatre (33 E. Canon Perdido St.) this Friday, July 30, at 8 p.m. Call 963-0761 or visit lobero.com for tickets.